Alchemy is described by Camel Audio as "the ultimate sample manipulation synthesizer". It's a synth powerhouse and yet is very easy to use thanks to its performance controls and remix pads. Just tweak the library of included presets from many of the world's top sound designers or dive in and analyze your own samples. AlchemyAlchemy features additive, spectral and granular synthesis and resynthesis, sampling, and a very capable virtual analog engine with unison and PWM. You can morph or crossfade between sources. You can import your own samples from SFZ, WAV or AIFF files. A wide range of analog modeled filters are included, in addition to a flexible rack of effects which includes all those from CamelPhat and CamelSpace as well as many new effects such as a high quality reverb. The innovative modulation system is extremely flexible, yet easy to use. Alchemy also features a powerful arpeggiator with the ability to import the groove from any MIDI file for immediate synchronization to a beat. Alchemy ships with over 2GB of samples and analysed content from in-house designers Tim Conrardy and Biomechanoid, as well as designers such as Ian Boddy, Robert Rich, Scott Solida and Nucleus SoundLab. A library of 300 presets from many of the world's top sound designers is included, arranged into categories for rapid access to the sound you require. A variety of expansion sound banks are in development. Alchemy is priced at $249 / €199 / £159. Cameleon owners will be able to crossgrade for half price - just $125 / €99 / £79. CamelSpace and CamelPhat owners will be eligible for a reduced price of $199 / €159 / £127. More information including a video and mp3s are available at the Camel Audio website. 300 presets covering everything from pads and soundscapes to keys, basses and leads designed by many of the worlds top sound designers including Junkie XL, John Lehmkuhl, Ian Boddy, Richard Devine, Big Tone, Arksun, Beej, Summa, Xenox, Tasmodia, Paul Nauert, Christian Kjeldsen, Rory Dow, Artvera, Pendle, Dangerous Bear, Biomechanoid and Tim Conrardy. Many years of dedicated sampling sessions of both unusual creative material such as the sound of chewing polystyrene to more conventional sampling of numerous acoustic instruments and voices, including a chamber choir. Advanced resynthesis engines help keep the library small, reducing the need for a huge disk-straining sample library. Samples are provided in open industry standard formats as SFZ and WAV files. Add-on preset banks in development. 16 controls per preset carefully assigned by the preset designer, for instant access to each presets most tweakable parameters. 8 remix pad variations per preset - click and drag to morph between variations. Unique 'auto assign' feature to assign a full set of performance controls with two clicks. 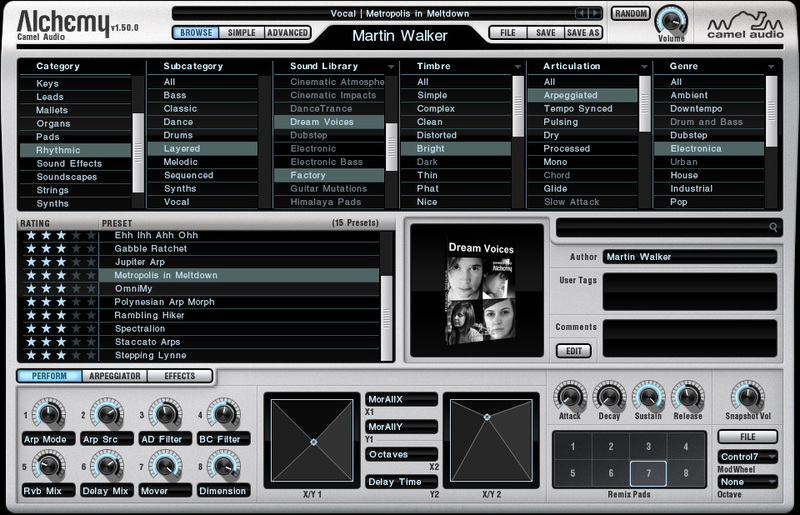 4 stereo sources each of which has additive, VA, spectral, granular and sampler engines. Morph between sources using advanced harmonic blending and precise time alignment. Crossfade between sounds with vector mixing. Modulatable stretch and position knobs for anything from tempo synced loops to wave-sequencing. Up to 100 zones per source using any synthesis method. Easy to use file import browser with sample preview. Micro tuning support with comprehensive categorized library of scales. Highly optimized code including SSE and Altivec optimizations. Up to 15 simultaneous filters. 31 different filter types including 18 analog modelled filters, 2 comb filters, 3 CamelPhat distortion algorithms and polyphonic ring modulation. Each source can be mixed between 2 parallel main filters each of which has an effects mix control. 3 filters per source configurable between serial and parallel modes; applications include formant filtering with free control over the frequency and bandwidth of each formant. Camel reverb, acoustic reverb, 2 delays, 2 mod fx (each capable of flanger and chorus effects), 2 distortions (each has bit crusher, tube, mech and xcita effects), bass enhancer, compressor, multi mode filter, 2 bandpass filters and band reject mixers, 2 three band EQs, panner and amplifier. 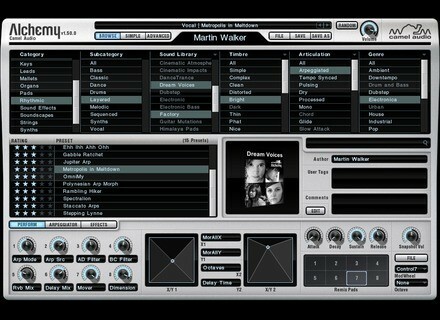 All of the CamelSpace and CamelPhat effects included. Virtually all effects parameters are modulatable. Acoustic reverb with detailed control of time, damping and room design. Up to five effects blocks can be applied in any order. Flexible delay featuring two filter slots, crossover, offset and initial delay controls. Band pass filters and associated band reject mixers allow you to apply effects to specific frequency ranges for effects such as multiband distortion. Separate control of the velocity, pitch and pan of each note. MIDI file import for drum patterns and melodies. 'Groove import' to synchronize to a particular drum pattern. Wide variety of modes including up, down, up/down, down/up, as played, random and chord. Many parameters including multiple latch modes, key splits, played key velocity control, octave and source controllable from the modulation system. Ability to control one source or all four. Up to 600 stereo oscillators. Realtime modulation of amplitude, pitch and pan spectrums by any modulator - for example, control the odd/even harmonic balance, pan partials using LFOs, stretch or contract the harmonic spectrum and lots more. Individual amplitude, pitch and pan envelopes for each partial. Easy to use additive editor with unique detail knob to simplify sounds for editing. Up to 600 oscillator unison with pitch, amp and pan control of unison oscillators. Large library of single cycle waveforms from classic synths to new designs by Galbanum. Phase vocoder analysis for high quality pitch and time stretching. Noise resynthesis mode using 256 band noise shaping. Advanced graphical sonogram editing - choose from a range of brushes and select the colour and opacity. Graphical spectral cut, copy and paste - cut or copy and paste specific frequency and time regions. Sampler or granular playback modes. Freely modulatable parameters including grain size, density (up to 10 simultaneous grains), random grain time and random pan. Selectable and customizable granular window shapes. Up to 16 LFOs, 16 AHDSRs, 16 MSEGs, 16 step sequencers - only those you use are displayed. Virtually every knob is modulatable by up to five different modulators (including modulation-depth knobs, modulator parameters, ...). Advanced mod-map feature for anything from drawing custom velocity curves to creating algorithmic random note in a scale effects. XY-mseg shows you a vector style view of two parameters such as morph X and Y position, with ability to import XY timelines. Modulation arcs intuitively show the range of modulation. Modulation details of selected knob automatically displayed. Right click on knob and select 'add modulation' to rapidly add and assign modulators. Playing speed modulation source allows variable response to fast and slow playing; for example to crossfade between staccato and legato samples. Unique flip-flop modulation source for customizable round robin effects. Personalized keyfile for hassle free copy protection. Available as a download or on DVD. MU Technologies Mu Voice 1.2 Mu Technologies has released new demo versions of Mu Voice v1.2. These demos do not require the iLok USB dongle.